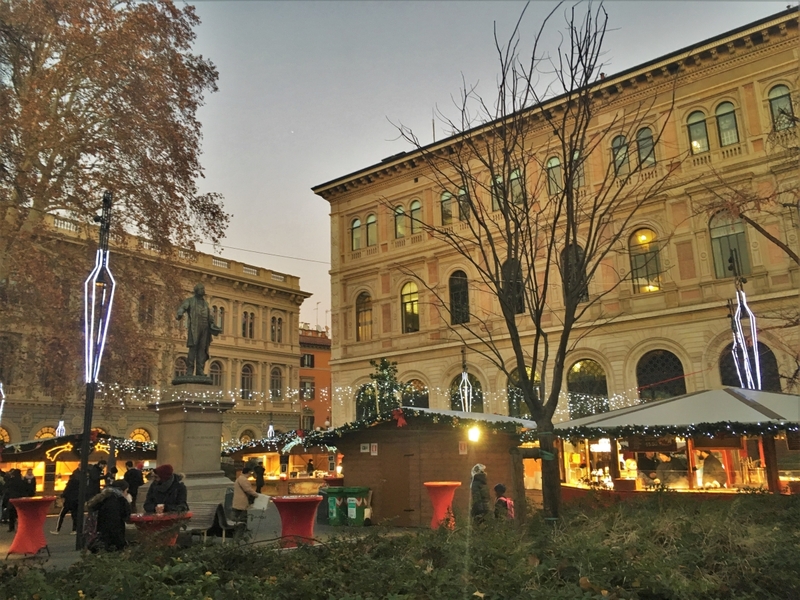 The French Christmas Market … in Italy. 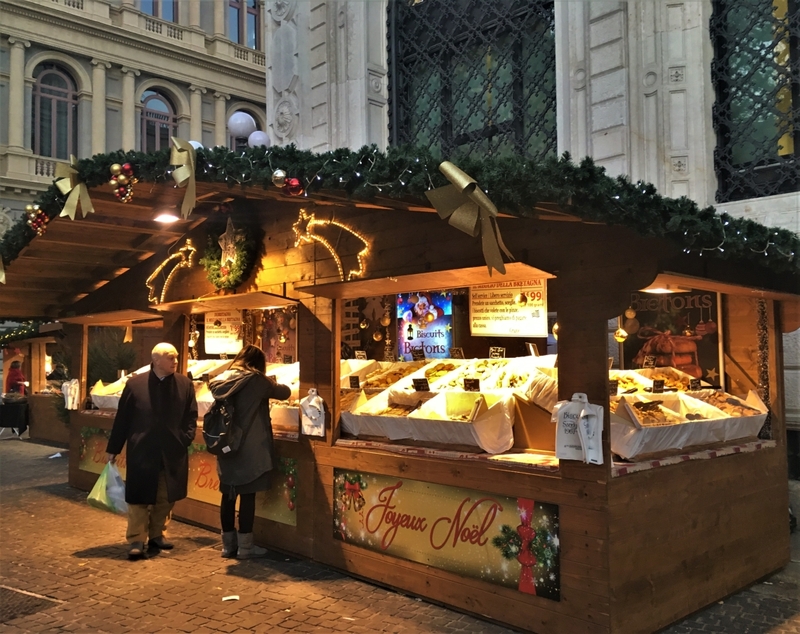 Along with the regular markets taking place throughout the week, a new influx of holiday markets has arrived. Some have come and gone, while others hold out through the new year. 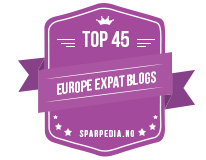 Some are purely Italian, while others have a more foreign flavor. 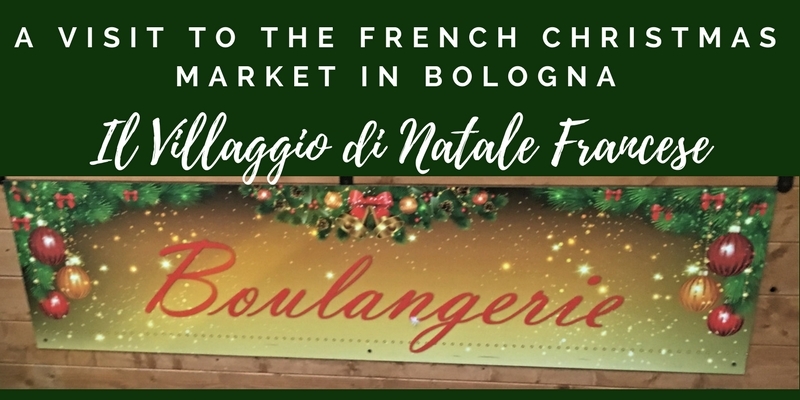 Once such market is il villaggio di natale francese, the French Christmas Village. 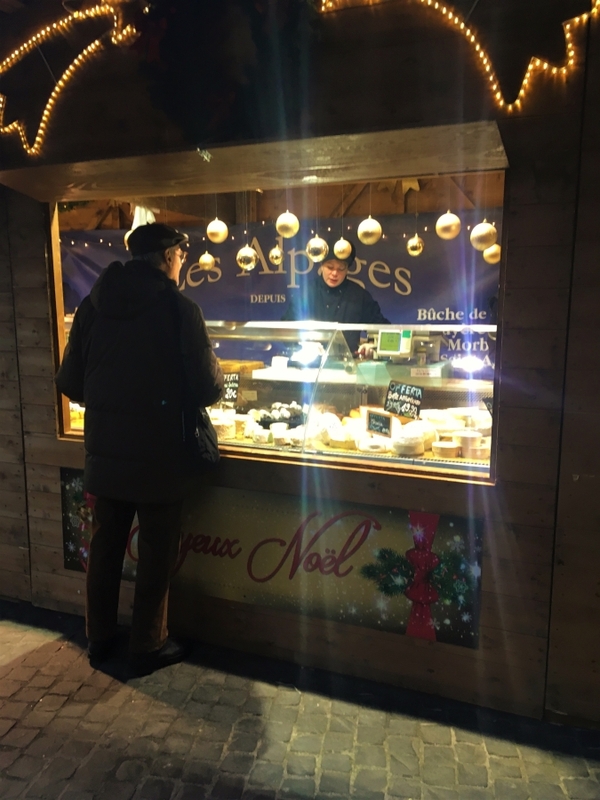 This little Christmas market has packed up and said au revoir for the season, but we managed to stop by for a quick visit on its last night in town. The market took place in the Piazza Minghetti, which is a charming little square surrounded by some beautiful, classical-style buildings. It’s also just a short walk from some of the fanciest shops in town, as well as some of the most beautifully decorated portico ceilings in the city. While the stalls weren’t excessive in number, they were certainly picturesque. They reminded me of some of the wooden Christmas market stalls that were set up frequently in Utrecht for some of the festivities in recent years. All that was missing was a light dusting of snow and some reindeer for a pure holiday display. The stalls themselves sold a variety of wares, including a spice stall that had me seriously considering buying some pink pepercorns and some of the various curry spice blends they had on offer. Of course, there was also plenty of cheese, hats, fabric pieces, chocolates, macarons, decorations, and other odds and ends. You could also purchase drinks and food to enjoy right there. I do slightly regret not giving in and trying some of the numerous hot dishes, including the cassoulet. Everything smelled divine and my mouth was watering. The one stall I ended up not being able to resist was the cookie/biscuit stall. 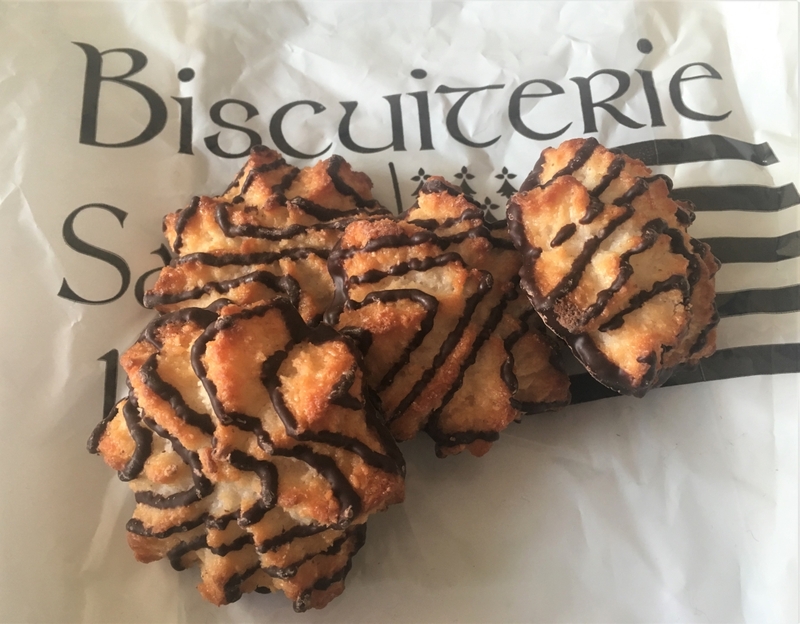 Sure, they had the classic madeleines, but they also had macaroons, which are delicious mounds of lightly sweetened shredded coconut on a biscuity base, with drizzles of chocolate. For my fellow Americans, think of a fancier, bigger version of the beloved Girl Scout Samoa/Caramel deLite cookies. They are perfect and I’m so glad I gave in and got some. In fact, I bought four, just enough to allow me one a day through Christmas. They are my morning treat with my coffee, a perfect combination. We missed the elves, which a friend told me about, but in all, I’m glad we stopped by this little bit of France in Bologna. It was the perfect size; big enough to be appealing rather than overwhelming. 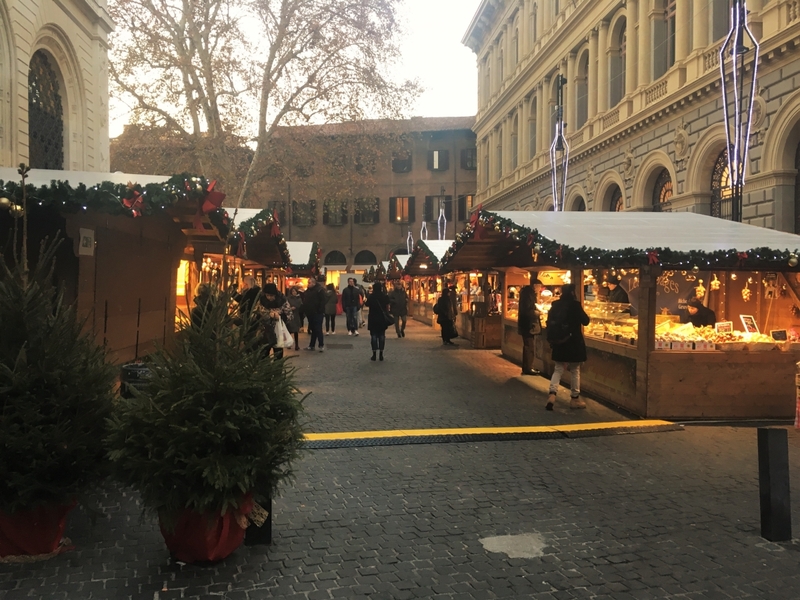 There are a few more Christmas markets in Bologna that I’d like to visit (or revisit, in one case) before the end of the holiday season. Whether I make it or not, at least I’ve seen a couple that are helping me get into the holiday spirit.